Kris Meeke will race for Citroen in the World Rally Championship for the next three years after agreeing a new deal with the French team. The 36-year-old Northern Irishman ended the season without a drive for 2016 after Citroen revealed it would not take part in next year's championship. However, the team has now decided to compete in selected rallies in 2016 before a full-time return in 2017. 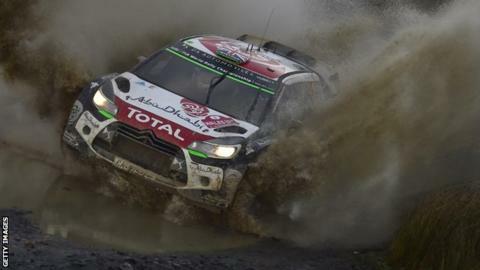 "I've very excited about the challenges that lie ahead," said Meeke. Meeke won in Argentina in April, Citroen's only 2015 victory, and finished fifth in the series. The eight-time winners of the championship planned to take a year away from the sport to concentrate on the development of a new car running new regulations for 2017. Meeke's priority next year will be working on developing the new 2017 CR WRC - he and team-mate Stephane Lefebvre will race in a PH Sport DS 3 WRC next year. "Various options were available to me to pursue my career, but I chose to stay with Citroen Racing to reap the rewards of the work done over the last two years or more," added the driver, who is from Dungannon, County Tyrone. "I began my career in motorsport as a design engineer so although I can't wait to get into the car, I'll be following every stage of the design and assembly of the first car with great interest."